Many will sympathise with the Greenock station when they read of the loss of Mrs. Faid. Ever since she came from the South Shields Circuit some thirty years ago she has been one of the most devoted members of Scottish Primitive Methodism. Through all the years she has pursued a course of loyal and unwavering consistency. Sunday and week-day, morning and night, she was in her accustomed pew. She was always a spiritual force in our midst. Tender in trouble, highly gifted in conversation, and cheerful in manner, she was always a welcome visitor in the homes of the people. To each succeeding ministry she was unfeignedly kind. She belonged to the Society of Encouragers. It was not her way to speak ill of anyone. Her affection for her family was remarkable. Perhaps nothing gave her greater pride than the fact that her youngest son (Rev. N.N. Faid) is in our ministry. A capital correspondent was she, but the secret of all her affectionate activity was her life-long correspondence with her Saviour and Lord. Sarah was born in 1843 at South Shields to parents Robert and Ann. Robert was a pitman. Prior to her marriage Sarah worked as a domestic servant. Sarah married John Faid (1841-1903) in the summer of 1864 at South Shields, Co. Durham. Census and birth records identify eight children. 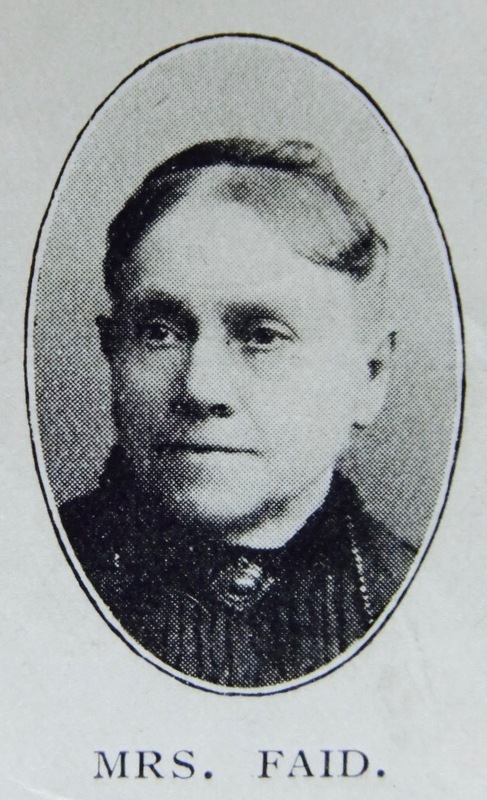 Sarah died on 29 April 1913 at Greenock.